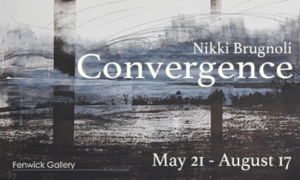 Convergence – a new exhibition by Nikki Brugnoli – opens today in Fenwick Gallery. Convergence focuses on the intersecting and overlapping lines of artist Brugnoli’s research over the last four years in Virginia and Pennsylvania. Disregarded, post-industrial structures from her past and present as well as widening horizons converge through a series of mixed media drawings, screen prints and photographs. These investigations are engaged meditations on memory and loss, abandonment and reconciliation. The exhibition will run through August 17. For more information, visit http://fenwickgallery.gmu.edu/exhibits/convergence/. This entry was posted in Exhibit, Fenwick Gallery, FYI, News by Jessica Clark. Bookmark the permalink.